HARDCOPY 2017 is now open for applications. The main reason I have a book publishing deal is because of HARDCOPY 2015 and I simply can’t recommend this program enough. Don’t think too hard about it – just put your application in! Apply here. In 2017 the program will focus on nonfiction project. The program alternates each year, so last year the focus was on fiction. In 2015, the year I participated, the focus was nonfiction. HARDCOPY does not specifically aim to have its participants achieve publication as a direct and immediate result of the program. 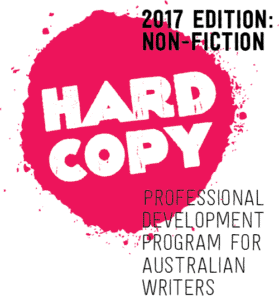 Rather, HARDCOPY focuses on (1) manuscript/project development, (2) education about how the Australian publishing industry works, and (3) building connections and relationships within the industry/writing community. Any publication outcomes that may occur because of the program are considered an added bonus. And yep – I scored the bonus! As did several of my colleagues. HARDCOPY aims to develop writers who will have longevity as Australian writers. A Win! Accepted into the HARDCOPY Professional Development Program – In which I explain the program and jump around in excitement. There’s also an addendum about applicants receiving feedback. HARDCOPY Professional Development Program: the preparation – In which I worry about the material I have to prepare for workshopping! HARDCOPY Round One – Phew – An overview of the first weekend, which the class spent with editor Nadine Davidoff in a writing workshop. HARDCOPY – Reading List – After that first weekend workshop, there were a number of writers I wanted to follow up, to read more of their work. Online Discussion With Lucy Treloar, author of Salt Creek – HARDCOPY participants (past and present) were lucky enough to take part in an online Facebook discussion with Australian novelist Lucy Treloar. Here are some of the highlights of Lucy’s responses (reproduced with the permission of Lucy, and of the HARDCOPY project officer Nigel Featherstone.) For 90 minutes Lucy was inundated with questions and she gamely fielded them with good cheer and fascinating insights. Online Discussion with Clare Wright, author of The Forgottten Rebels of Eureka – As above, only this time it was Clare Wright. I could not have been happier!! HARDCOPY – what do publishers want? – The second weekend, in September, was like a mini writers festival. Over two days we sat in a lecture theatre and heard presentations from a wide variety of publishing industry insiders. Of course we could then ask questions and initiate discussions. This weekend opened up a whole new world to me. The sessions included: What do publishers want? The role of an agent. Copyright and contracts. What I wish I knew before I was published. Let’s get digital. Telling your story with social media. Reviews – the state of play. Overcoming stage fright. Publishing in a digital environment. Experiments in the reader-author relationship. It sounds pretty good, doesn’t it? And the speakers were very highly credentialed: Alex Adsett, Eva Bui, Mary Cunnane, Paul Daley, Jacinta Dimase, Linda Funnell, Charlotte Harper, Anna Maguire, Karen Middleton, Gordon Peake, Peter Stanley, Meg Vann, and Jen Webb. Mary Cunnane – wisdom and advice from Australia’s favourite literary agent – Mary was one of the keynote speakers during the Intro to Industry weekend and she merited a post all on her own. Full confession: At this point I was too nervous to actually speak with her, but by the end of the Publisher/Agent Feedback weekend I gladly cornered her to ask for advice and information. How to be an author – Notes about my thoughts and take-aways from the Intro to Industry weekend described above. Another HARDCOPY win – After participating in the writing workshop, and then the Intro to Industry weekend, I was one of ten people selected to take part in the Publisher/Agent Feedback weekend. Seven publishers and two agents read my work, and each spent 30 minutes with me to provide advice and feedback. Priceless. How to get your writing read by a publisher (or seven) – An overview of the Publisher/Agent Feedback weekend, including a selection of the feedback I received. Does an emerging writer need an agent? I’m still in touch with many of my classmates from 2015. I love hearing (via the Harcopy Facebook group) about the successes and thoughts of other Hardcopiers, from other years. Apart from anything else, as a result of HARDCOPY I’m a member of a community of writers – and that would have been worth the price of entry all on it’s own. Have enjoyed following your ‘Hardcopy’ journey. There can be no doubt about how much you have got out of it! Thanks! And yes, I’ve benefited enormously. I will confess, though, that some of my classmates have some reservations about the program. It would be difficult for anyone to attend, for example, if they couldn’t afford to get to and stay in Canberra (although one 2015 participant from northern Qld received a grant for just that purpose from his local council, I think). The first weekend of ‘writing workshop’ was less workshopping and more being taught from the front of the room. Some would have preferred that emphasis to be reversed. And some felt hard done by after not being selected within the final ten who attended the Publisher/Agent Feedback weekend. But that’s all to be expected, I suppose. And the organisers have been very open to receiving such feedback.